Petite mauve posy with a beautiful Ecoya candle and delicious chocolates. Charming and petite this delightful selection of flowers isn�t overwhelming or extravagant , although we at Florist with Flowers think this petite little charmer is just right for any occasion . 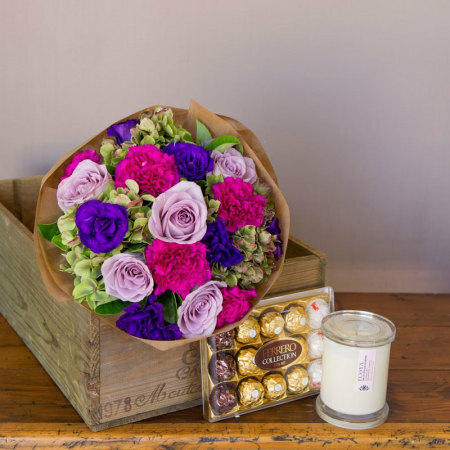 This posy includes purple lisianthus, fuchsia carnations and mauve roses for the extra touch of sweetness . To make this gift even more special, it comes with a gorgeous Soy candle by Ecoya and a delicious box of chocolates. Deliver this gorgeous surprise today to that special someone.